I think it’s every girl’s fantasy to visit Paris. It’s portrayed as such a romantic city – full of love in the air – what girl could resist? And with my deep love of french cinema, you can imagine just how irresistible the thought of visiting the “the city of light” is to me. 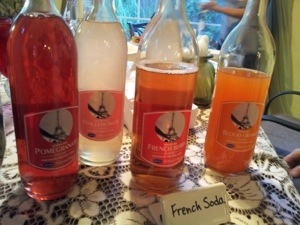 French sodas While I was lucky enough to find these brightly colored French sodas with the Eiffel Tower pictured on the label, you can also opt to print your own beverage labels yourself. Try to use pictures of famous Parisian landmarks or classic French things: croissants, berets, Vespas…how about a couple kissing in public? Use your imagination! Avery has easy-to-use printer-friendly labels that work great. French Canapes My best gal pal (and fellow Hip Chick Hostess) Monica, decided to make some delicious French canapés as an appetizer. The cool thing about canapés is that they are beautiful, delicious, and – best of all – super easy to make. (A hip chick hostess’ dream!) You can pretty much use any topping combinations you like. Just make sure they all go on a fresh baked baguette. 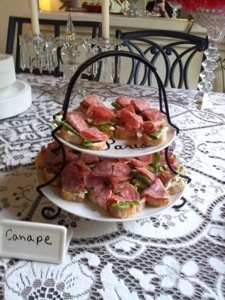 For Monica’s delicious and easy canapé recipe, click here. Also, did you notice the white serving tray, displaying the word “Paris” on the top plate? This is an add-on decal we created using black Contact paper and a handy, Xacto knife. Read more about this in our next article, Customizable Serving Trays In 5 Easy Steps. We’ll show you how we made a cute French Poodle serving dish as well as a zebra striped tray for Monica’s Animal Print Birthday Bash. Eiffel Tower Centerpiece What’s a French birthday party without an Eiffel Tower centerpiece? I found mine at Pier 1 Imports, but you can also try Cost Plus World Market (another one of my favorite haunts). Then again, you don’t really have to spend that much, especially if you only plan to use it once,Visit your local consignment shops or check out what the internet has to offer. 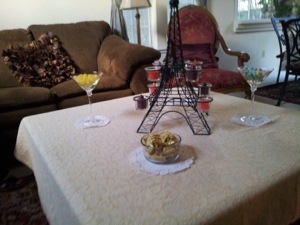 Or why not take a stab at making your own Eiffel Tower centerpiece? Simply print four, identical images of the front of the tower on 8.5″ x 14″ (legal size) paper. Next, glue each piece of paper onto a piece of poster board, then use an Xacto knife to cut each side out. Finally, use a little tape along the inside of the tower to assemble each side together. Fini! Your centerpiece is done! French Pastries (pâtisseries) Finally, the tour de force: dessert! 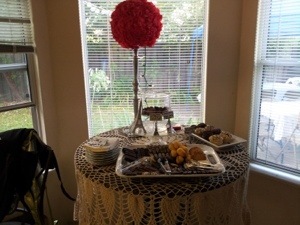 We featured classic French desserts such as truffles and cookies. Yum! Notice the red pomander flower balls affixed to the pewter candlesticks? These are definitively French: pomander, or pomme d’ambre means “apple of amber” in French. (Very fitting for MY birthday, no?) For a step-by-step tutorial on how to make these gorgeous (and inexpensive) decorations check out my article, Crepe Paper Flowers & Pomander Kissing Balls. Needless to say, if you plan on serving lunch or dinner, it would be perfect to have a few French dishes on the menu. We went with Chicken Coq Au Vin and French green beans! What other French party ideas can you think of including? Share your thoughts, comments, and inspirations in the “Comments” section below. Au revoir for now!! !